If you are worried about your dark and lifeless skin, here is a way to lighten your skin in a natural way. The bleaching creams that you buy from the market are full of chemicals which may harm your skin rather than do any good. These can make your skin look fair, but have lots of side effects too. 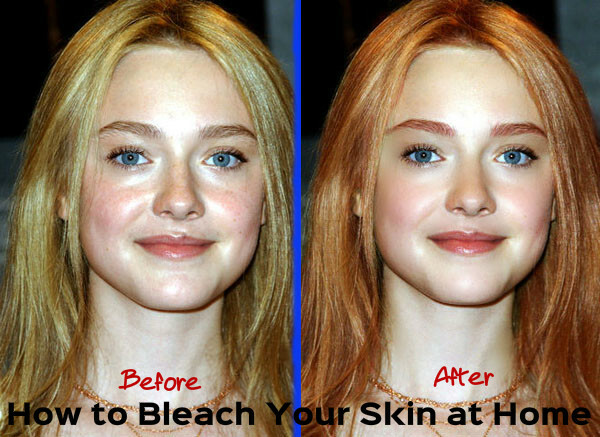 So, the best way to get a fairer skin is to bleach your skin at home using natural ingredients. Since the ingredients used do not contain any chemicals, they are harmless and can enhance your skin tone. Homemade bleaching packs are also much cheaper than the bleaching creams that you buy from the market. Here are some bleaching packs that you can try a home and get skin that is fair and beautiful. Cucumber is a good bleaching agent and great for your skin. Take one medium sized cucumber and peel off the skin with a peeler. Now grate the cucumber and squeeze the grated cucumber to get its juice. Next you have to take aloe vera juice and add it to cucumber juice. Mix both of them well and then apply this pack on your face as well as the neck and back. This is great for lightening your skin. Moreover, it has cooling properties which makes it beneficial for soothing your skin and keeping it cool during the summer months. Lemon is said to be one of the best natural bleaching agents for lightening skin quickly and cheaply. It is also rich in Vitamin C and you will start getting positive result after the first use itself. Take a lemon and squeeze it to get its juice. Apply this juice directly on your skin. If you want to reduce the acidic level of lemon juice, you may add some honey, glycerin or curd to the juice. For better results, you can use this pack once in every week. When you apply this on your face, avoid the eye area. Wait for a few minutes and then wash your face with plain water. Remember not to go in to the sunlight once you have applied the face pack. Even after washing your face, you must not go in the sunlight immediately. Apply a good moisturizer on your skin to keep it well nourished. This is because the acidic property of lemon juice may make your skin dry. Orange is a citrus fruit and has got skin lightening properties. It is also rich in Vitamin C, which is essential for a healthy and glowing skin. Orange peel is also an effective bleaching agent and contains Vitamin C.
After you consume orange, do not throw away the peels. Dry them under the sun and then grind these dried orange peels to get its powder. Take some powder in a small bowl and add some honey and rose water to it. Mix them well to get a smooth paste. Apply this paste on your face evenly and wait till the pack gets dry. Now wash off with plain water. With regular use you will get a skin that is fairer as well as smooth and glowing. It removes all scars and dark spots and provides you a skin that is clear and evenly toned. Potato has the ability to lighten your skin. It is great for removing the tan that is caused when you are exposed to sun. Take a potato, peel of the skin and then grate it. Add some rose water to the grated potato and mix them well in a blender. If your skin is very dry, you may add some honey to the mixture. For oily skin lemon juice can be added. Mix them well and apply it on your face, neck, hands and other areas of the skin that may be exposed to sun. This is a good way to get an even toned skin. Wait for some time to get it dry and then wash off with plain water. Potato is gentle on your skin and bleaches the skin mildly. If you use this face pack regularly, you can see your skin getting lightened and even the dark spots begin to disappear. Oatmeal is used as a good exfoliator and helps in removing impurities on the skin. Mix this with yogurt, lemon juice and olive oil. Yogurt and lemon juice have bleaching properties and the olive oil keeps your skin well nourished. So a combination of all these ingredients provides you a face pack that cleanses your skin as well as moisturizes and lightens the skin. Tale 2 tablespoons of oatmeal that is ground, tablespoon of yogurt, 2 tablespoons of lemon juice and 1 tablespoon of olive oil. Mix them well to get a paste. Apply this pack on your face and wait till it gets dry on your skin. This helps in bleaching the skin well. After about 30 minutes, wash off with cold water. Pat dry your skin and apply a moisturizer o your skin. By applying this face pack two times a week, you can lighten the skin that has become dark due to pigmentation. It also helps in reducing dark spots on the skin. Tomato is a fruit that is acidic in nature and rich in Vitamin C. Vitamin C is excellent for your skin. Take one ripe tomato and mash it well. Now strain it to remove the seeds. Add one teaspoon of curd to it and mix both the ingredients well. Apply this pack on your face and wait till it gets dry. Wash off with lukewarm water and then pat dry your face. By using this face pack regularly, you can get rid of scars and spots on your face and get a skin that is evenly toned. Since the ingredients used are natural, you will not suffer from any side effects. However, if you have a damaged, wounded or burnt skin, you must avoid these face packs. If you are allergic to acids, you must not use face packs with lemon or orange as one of the main ingredients.